If your kids are looking for something to do other than swing on the monkey bars, it may be time to get the creative juices flowing. It doesn’t have to cost you an arm and a leg to foster a creative environment. Crayola sells a wonderful array of washable, watercolor liquid paint that pours into a palette for easy application. Painting outside is one of the easiest family friendly things to do in Los Angeles, especially with some great music playing and a picnic lunch. Hang the finished artwork on your clothesline and walk through the makeshift museum, but let your kids give the tour. I-phones, computers, i-pads and televisions seem to have a strong grip on the eyes and fingers of the young and it’s no wonder; technology is everywhere and children are drawn to it. Finding great family activities in LA that get those little hands and eyes away from screens can be difficult, but a good place to start is the great outdoors. One great spot is the pool at Santa Monica Community College. At the reasonable admission price of $6.25 for non-residents, $3.25 for residents gets you the entire day lounging poolside (2 heated pools) while your little ones play in the water. Not all family friendly things to do in Los Angeles have to be lame for the adults too. 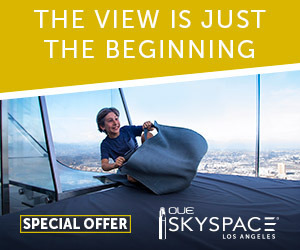 Check out Los Angeles visitor information for some great activities for kids and adults alike. For events where the adults get a slice of the fun, check out Skateland, one of the last remaining skating rinks in the city. Little kids love skating, older kids love this place because it feels like a nightclub, and adults can kick down to the jams, or get some peace by letting the kids have some fun by themselves. The LA Zoo is also a great kids place where adults can save their sanity. It’s beer friendly. Buy a beer anywhere in the zoo, and enjoy it through the zoo’s grounds. Zoology and booze go great together. Another one of the family friendly things to do in Los Angeles is a visit to the Last Bookstore. It’s not just a bookstore, but also includes a record shop, a vintage toy shop, and a yarn shop. Kids will not only get a kick out of the toy store, but also the many cavernous rooms that make up this store. It’s great for exploring and has something for everybody, including Mom and Dad. There’s even a root beer and chocolate soda pop shop if you need something to bribe the kids to get them in the door. The whole store is a trip the entire family won’t forget. What San Diego Things to Do and See Are You Doing this Weekend? If you already know what you're doing this weekend, great! If you're not quite sure what San Diego things to do and see you're interested in, or you're not thrilled with your current plans, why not check out our Weekend Roundup section to learn what new shows, exhibits, festivals, restaurant openings, and more are happening. If you'd like to go to a fancy restaurant or experience a little casual dining in San Diego, use our Restaurant Finder feature to search for a place to eat by cuisine and price. Our City Guide includes tons more things to do, ranging from shopping, to night clubs, to casinos, and other options.